Spent a lot of the week trying to gather the last few photos I need for my next book. It proved successful. Just one needed now – Whitecliff’s Bay’s Bob Humphray. He founded the Whitecliff Bay Holiday Park and was a super darts player. Also trying to arrange some future interviews. Have heard that another famous person has moved to the Island. Looking forward to finding out more. Was taken out to lunch on Wednesday by a lovely man, Tony Wheatley, who has been in the record industry for many years. It was my first visit to Thompson’s of Newport. It proved a real eye opener – and such a welcome change from my scampi and chips in several Island pubs. Tony is in my new book. Had a fantastic end to the week. I appeared on stage at the 5th Renown Films and Talking Pictures Film Festival. 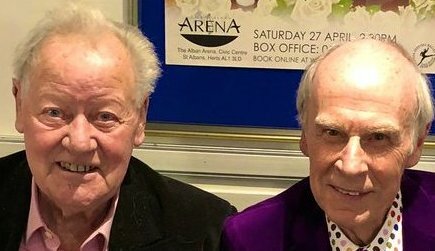 I was thrilled to interview both Marty Wilde and Craig Douglas live on stage. The event was sold out and I was also thrilled to see my son, Sean, interview Glyn Baker, the son of the famous actor Sir Stanley Baker. There were around 1000 people at the St Albans Arena and the atmosphere was amazing. Also on stage were Robert Powell, Jenny Hanley, Brian Murphy, Linda Regan and Anne Aubrey. I’d managed to persuade Craig to come out of retirement for his first stage appearance for nine years. Both he and Marty got great receptions. I was also lucky enough to sell quite a few of my books. A few ex-Islanders came up to say hello.